Premise: Three qualifying rounds are played with two contestants competing in each round. In each round, two contestants will sing a song while enduring and performing a physical challenge designed to purposely distract them from completely singing the song. After each pair of contestants finish their song in each round, the audience will vote who performed the best. The winner of each qualifying round will advance to the final Karaoke Showdown Round. In the Karaoke Showdown Round, the three finalists will compete in one final challenge. The longer the contestants stay in the challenge, the more money that will be at stake. The last contestant to survive the challenge will win the game and the grand prize cash at stake in the round. The maximum grand prize is $10,000. As with You Deserve It! 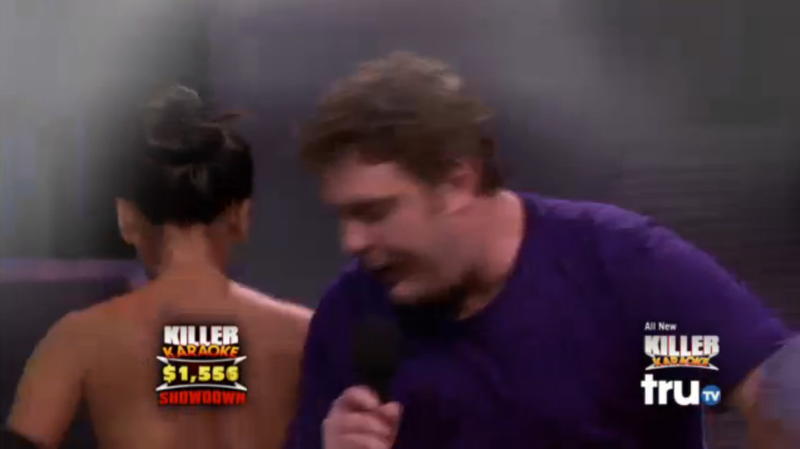 and Million Dollar Mind Game, Killer Karaoke is simply just another game show hybrid. Although TruTV’s new game show is a crazy combination of The Singing Bee and Distraction, Killer Karaoke is a very fun and entertaining show to watch. The challenges within the show’s format are similar to the ridiculous, asinine, and obnoxious stunts performed on MTV’s Silent Library. I have also noticed the show has incorporated a small element of the 2004 version Star Search with the civilian audience posing as the judges for each pair of acts to determine the winner of each round. As host, the unpredictable and seemingly indestructible Steve-O is an excellent candidate for a show as insane and dangerous as this one. Essentially, anybody from the cast of Jackass would have been a good fit for the show. Nevertheless, Steve-O carries the show well and looks like he is having a fun time emceeing and torturing the contestants. The only problems I have with show are the leniency of the contestants singing the lyrics, especially while performing the final round challenge. I believe that contestants should be penalized in the final round for not singing the lyrics, such as $250 or $500 for each second they don’t sing or mumble the words. I have seen too many instances where contestants have gotten away with that and it takes the fun out of the show. Overall, Killer Karaoke is a fun way to kill an hour. I love the creativity for each stunt and although the contestants are being tortured relentlessly, the contestants as well as Steve-O look like they are having a lot of fun on the show. Despite the obnoxious cliffhanger commercial breaks between rounds, TruTV did a good job with Killer Karaoke. I can envision this show lasting for at least two or three seasons. Watch new episodes of Killer Karaoke every Friday at 8:00pm on TruTV!